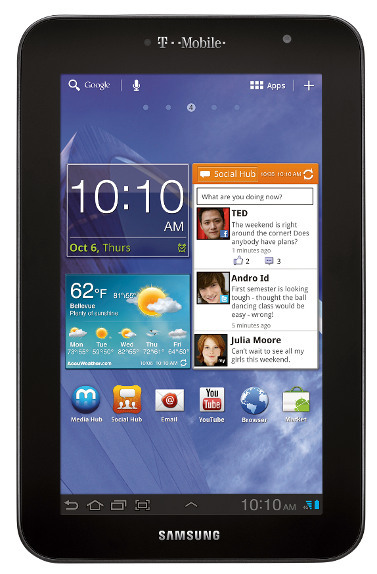 T-Mobile USA has announced that the Samsung GALAXY Tab 7.0 Plus would be available from November 16. This is their third tablet to support HSPA+ connectivity after the 7-inch Springboard and the Samsung GALAXY Tab 10.1. The Samsung GALAXY Tab 7.0 Plus has 7-inch WSVGA(1024X600) PLS LCD multitouch display. It is powered by 1.2GHz dual-core processor runs on Android 3.2 (Honeycomb) OS. It is 9.96mm thin and weighs 345g. It also comes with 3 MP Auto focus camera with LED Flash and a 2 MP front video calling camera. Other features include, 1GB RAM, 16/32GB Internal memory that is expandable up to 64GB with MicroSD. The connectivity features include, 3G HSPA＋, Bluetooth 3.0, Wi-Fi 802.11 a/b/g/n with Wi-Fi Channel bonding & Wi-Fi Direct. It has 4,000 mAh Li-on battery. It comes with Samsung Media Hub so that the customers can rent or purchase movies and purchase TV programs and share that content on up to 5 compatible devices on the same account and haspre-loaded WildTangent app that would let the customers play premium games for free, as well as rent or purchase games. Zinio app offers more than 5,000 full color magazines to browse, and Blio eReader lets you read eBooks on the go. The Samsung GALAXY Tab 7.0 Plus would be available from November 16 for $249.99 down payment at T-Mobile retail stores with a $50 mail-in rebate, with a T-Mobile Value Mobile Broadband plan, two-year service agreement, and 20 interest free monthly payments of $10 on approved credit.